While SMUD commits to be safe, always, we encourage customers to take safety precautions in their own homes as well. Use electrical cords wisely. Repair or replace cords that are frayed or cracked. Always remove a cord from the outlet by pulling on the plug rather than the cord itself. Cords should never be nailed or stapled to a wall, baseboard or any other object. Cords should not have any furniture resting on them or be placed under a carpet or rug. Do not leave a cord where it can be stepped or tripped on. Protect yourself from electrical shock by using Ground Fault Circuit Interrupters in kitchen and bathroom outlets where water and electricity may come into contact. Install light bulbs that are the correct wattage for the size of the fixtures. Protect children and pets by covering unused wall outlets with plastic safety caps. Never force a plug into an outlet if it doesn't fit. Doing so could lead to fire or shock. Plugs should fit securely, and outlets should not be overloaded. Keep children and pets a safe distance away when you operate a mower, chain saw or other power equipment. Always turn off and unplug the tool or appliance you are using before making adjustments or repairs. Don't use any electrical tool or appliance in the rain or on wet surfaces, or while standing in water. If a cord overheats, turn off the appliance or tool. Install shock-protecting Ground Fault Circuit Interrupters (GFCIs) on outdoor outlets. Never leave electrical equipment or yard tools unattended. If an electrical tool falls into water, always unplug it before reaching into the water to retrieve it. Planning to trim trees? Avoid contacting power lines, whether directly or with another object. If a tree limb is in contact with a power line do not trim it. Call our tree trimming employees at 1-916-732-5854. Learn more about how SMUD trims trees. Before digging in your yard, take precautions against coming into contact with buried power lines. Learn the exact location of underground power lines that cross your property. Call 811 at least two working days before you dig. Because today's homes are fairly airtight and do not provide much ventilation, it is never safe to use an open fire or to burn charcoal inside your home. Burning wood or charcoal emits carbon monoxide. Inside your home, this invisible and odorless gas can kill quickly. Never use a barbecue grill in an enclosed area. Never heat a room with a stove, oven, kerosene heater, dryer or other non-ventilated heaters. Never burn anything in your fireplace that is not recommended by the manufacturer such as treated or painted wood. Never use gasoline or starter fluid to ignite a fire in the fireplace. To get a copy of the Safe Home Heating brochure, please call SMUD Customer Service at 1-888-742-7683. When using a generator, you need to make certain that no electricity is flowing back into SMUD lines. The law says you are responsible for any injuries or damage to your property, your neighbor's property or SMUD's property from an improperly installed or improperly operated generator. SMUD does not recommend installing a generator directly into a home or any building wiring. However, if you must connect a generator directly into a wall outlet, turn off the power to your home or business by turning off the main disconnect switch (breaker) to the "off" position. This keeps energy from feeding back into the SMUD lines. If using a permanent standby generator for business or personal purposes, an approved transfer switch is required to keep your generator from back feeding into SMUD's system. The generator installation and operation must meet our interconnection requirements. Electromagnetic fields (EMF) are found wherever you have electric power. Questions have been raised as to the possible health effects of these low-frequency (60-hertz) fields. Can EMF harm your health? Electromagnetic fields are present wherever electricity flows—around appliances and power lines, and in offices, schools and homes. Many researchers believe that if there is a risk of adverse health effects from normal residential exposures to EMF, it is probably just at the limit of detection for human health studies. Nonetheless, any possible risk warrants further investigation. Varying results from epidemiological studies that looked at estimated EMF exposures and childhood leukemia are consistent with a weak link. Laboratory studies, including those examining a possible mechanism for health effects (mechanistic studies), offer little or no evidence to support this weak link. Results from many research studies have been evaluated by international, national and California EMF research programs to determine whether EMF poses any health risk. Given the uncertainty of the issue, the medical and scientific communities have been unable to conclude that normal residential exposures to EMF cause adverse health effects. Nor have they established any standard or level of residential exposure that is known to be either safe or harmful. These conclusions remain unchanged by recent studies. SMUD and other California public utilities have been pursuing no-cost and low-cost measures to reduce EMF levels from new utility transmission lines and substation projects. You, too, may want to take no-cost and low-cost measures to reduce your EMF exposure at home and at work. Human studies have not produced a consensus about any health benefits from changing the way people use electric appliances. But if you feel that reducing your EMF exposure would be beneficial, you can increase your distance from electric appliances and/or limit the amount of time you use appliances at home or at work. For example, you can place phone answering machines and electric clocks away from the head of your bed. 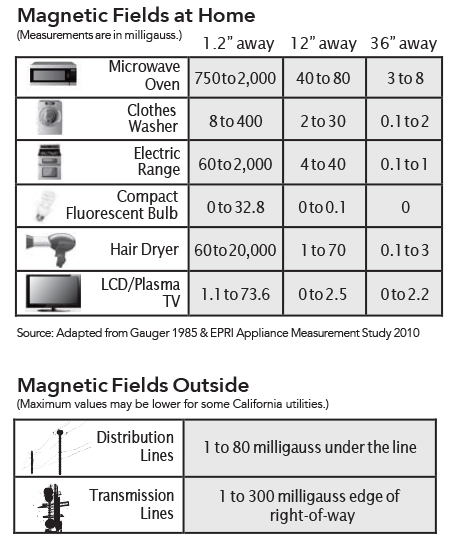 Increasing your distance from these and other appliances like TVs, computer monitors and microwave ovens can lower your EMF exposure. You can also reduce your EMF exposure by limiting the time you spend using personal appliances such as hair dryers, electric razors, heating pads and electric blankets. You may also want to limit the time you spend using electric cooking appliances. You can identify the sources of EMF in your work environment, and spend break time in lower-field areas. It is not known whether such actions will have any impact on your health. For more information, call SMUD for a free information package or free loan of a magnetic field meter at 1-916-732-6009. Strong winds and rain can damage power lines and equipment. When outages occur our crews work to restore service as quickly as possible, but it’s best to be prepared should your power go out. If you have an uninterruptible power source - a device with an internal battery that provides continuous power to computers plugged into it - remember that the device provides backup power for only a short time. Take the time to save any documents you’re working on and shut down your computer. Our crews perform maintenance activities such as tree trimming and equipment replacement year-round to help prevent outages. We have also increased our efforts to replace old underground cable, which will significantly lower the number of cable-related outages. More information about how we prepare and restore power during an outage. The information on this page is also available in brochure form in several different languages. If you would rather have this Winter Storm Tips brochure mailed to you, please call SMUD Customer Service at 1-888-742-7683. Because we have such a large service area, we appreciate that our customers keep watch in the community. Outlined below are the areas our Security Operations Team needs your help with most. Overgrown weeds and brush are not only unsightly, they provide a hiding place for people to gather, consume alcohol and narcotics and leave trash behind. This leads to other crime, such as burglaries of homes, businesses and cars, as well as increasing the potential for fire. Sometimes people use SMUD facilities, such as remote roadways, to illegally dump their trash, including furniture, tires and more. This is not only unsafe for our customers and employees, but negatively impacts the neighborhood around the property. Occasionally, our facilities are used as a canvas for graffiti artists, including gang members. This graffiti has been the catalyst for turf wars between rival gangs, which in turn further impacts your community safety. If you see any of these unsafe conditions in your neighborhood, give us a call – we’re here to help. Theft of metal, especially copper, costs you money and creates safety hazards. Often, the damage costs more to repair than what the thief gains. There is also the danger of power outages, which can be fatal to the perpetrator or even to an innocent person who happens on the scene. These crimes cost you money and create inconvenient power outages. They can also lead to death for the vandal or saboteur. If you are the victim of power theft, you may end up paying for stolen power. This crime can also lead to injury or death to the perpetrator. Get a description of the individual(s) involved including: height, weight, clothing, etc. Get a vehicle description with a license plate number. For emergency situations call 911 immediately. Call SMUD Security Operations as soon as it is safe to do so. Do not try to detain or apprehend anybody. Do not put yourself in harm’s way – property can be replaced, people cannot. Do not try to repair damage. Do not tamper with any evidence. Call SMUD Power Outage Line at 1-888-456-7683. Call SMUD Monday - Friday, 8:00 AM - 5:00 PM • 1-877-622-7683 or report them online here. The Sacramento area has some great rivers and lakes. We want you to enjoy these places while staying safe. So, we’ve teamed with DART, the Drowning Accident Rescue Team, to bring you these water safety tips. Wear personal flotation devices (PFDs) like a life jacket. Most drowning victims would be alive today if they had. Insist that all boat passengers wear Coast Guard-approved PFDs or flotation garments. Avoid mixing alcoholic beverages with swimming, fishing and boating. Practice using throw-line bags, ring buoys and other flotation aids with your family. Become familiar with the four behaviors associated with a drowning victim; head back, mouth open, flailing arms and no sound. Discuss hypothermia and its effects during an unexpected immersion. Practice survival strategies before your life depends on them. Automobile passengers are at best advantage if they have seat belts on when car enters the water. They limit personal trauma, help keep the victim in a familiar location and keep them conscious while determining how to get out. Panic is the swimmer's worst enemy. Relax and work with the water in a logical plan. This information is provided by SMUD and DART, the Drowning Accident Rescue Team. For more information, contact DART at 1-916-732-4500. Flying kites and perfecting your fishing cast can be fun. But that fun can turn dangerous if you play too close to power lines or other electrical gear. Here are some simple do’s and don’ts to make your play time safer. Never cast fishing lines under power lines. Avoid flying model airplanes near power lines. Never fly your kite around power lines or substation facilities. Avoid flying kites around trees or towers. Never release metallic balloons near electrical lines. Avoid climbing trees or using ladders in trees to retrieve kits, serious injury can occur. Don't let children play or climb on wooden utility poles or metal transmission towers or any trees that may bring them into contact with power lines. Build or fly kites made of wood or plastic. Use cloth for the tail. Fly kites in wide open areas, away from power lines. Use cotton, linen or nylon string. Metallic thread, wire or wire-reinforced string can cause serious injury or death if they come in contact with energized equipment. Fly kites in dry weather. Wet kite string is a strong conductor of electricity. For more kite flying safety tips and interesting aerodynamic experiments go to the NASA web site at http://www.grc.nasa.gov/www/k-12/airplane/kitesafe.html. Kite stuck in a power line? Call us. If a kite gets caught in electrical lines or falls into a substation, leave it there. Do not touch any part of the kite or string. Call us at 1-888-742-7683 and a SMUD employee will be able to safely retrieve it. Find out how to help us prevent accidental damage to our gas pipeline. Learn how to be safe around power lines and other SMUD equipment.